The 2014-2015 OFNC Birds Committee. Every month a dedicated group of OFNC bird enthusiasts meet at the Fletcher Wildlife Garden to discuss bird-related news in the Ottawa region and to plan bird-related events and conservation initiatives. If you have participated in a bird-related OFNC event, visited a bird feeder located in an Ottawa greenspace, or requested help with an ID from identifications@ofnc.ca, there is a good chance you have come in contact with the work of the OFNC Birds Committee. Every week, notable sightings data is packaged into a report and disseminated on the Ontario Field Ornithologist’s OntBirds email list, the OFNC website, and the OFNC Facebook page. If you are thinking about going birding in the Ottawa region, these reports are a great resource for finding local birding hotspots at any time of year. Due to increasing and widespread concerns regarding disturbance of wildlife and property, the OFNC Birds Committee no longer reports owl sightings on the internet, though reporting of all bird occurrences to the committee is encouraged for the maintenance of local records. Please direct your sightings to sightings@ofnc.ca. 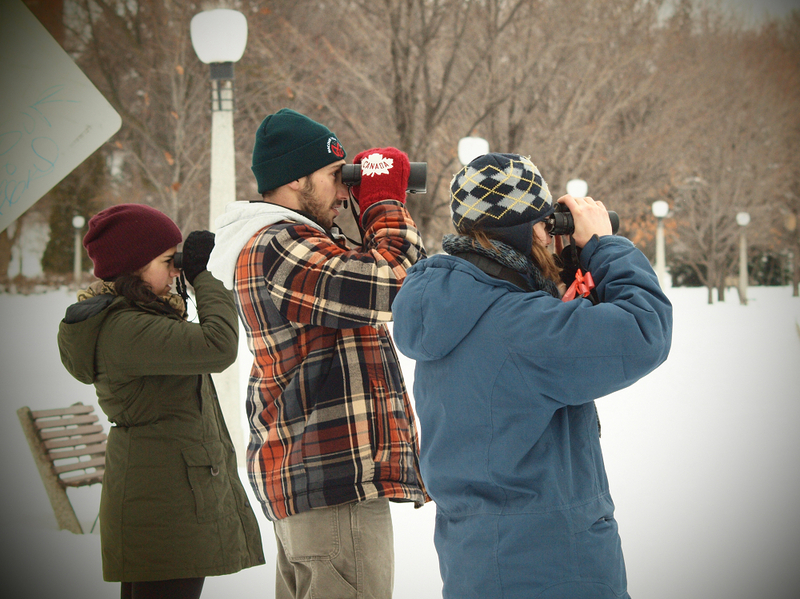 Since the inaugural Ottawa event in 1920, the OFNC has participated in the Audubon Christmas Bird Count. 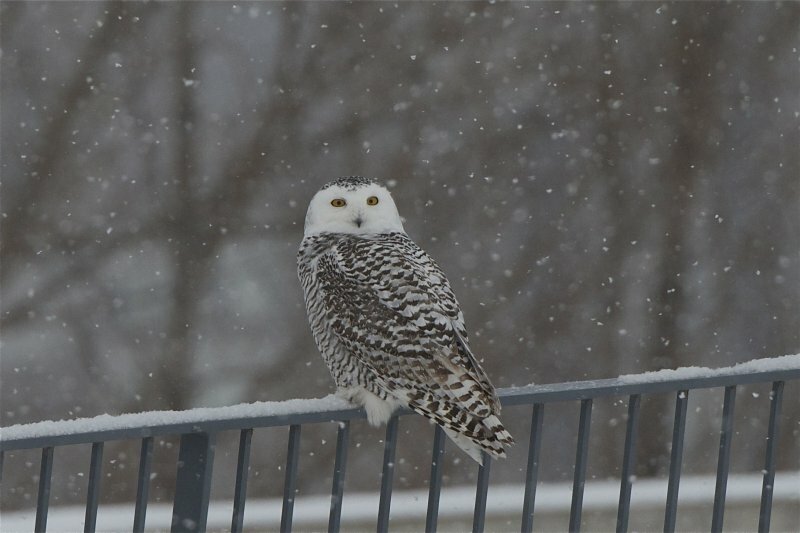 Each December, the Birds Committee in partnership with Club des ornithologues de l’Outaouais organizes the Ottawa/Gatineau chapter of the count. New and seasoned volunteers are encouraged to participate each year. The 2014 report will be available shortly on the OFNC website. As well, a write-up on the 2014 event appeared on this blog in late December. Clementine, one of three chicks from the 2014 Data Centre brood, tests the wind, June 29, 2014. 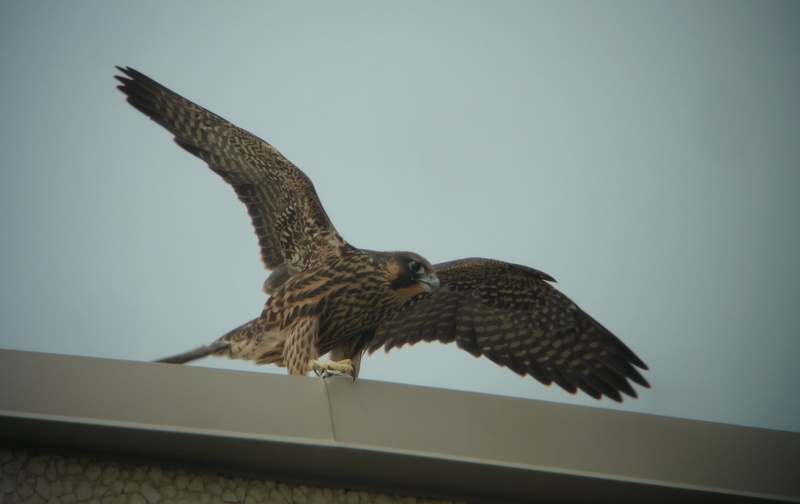 The Ottawa Peregrine FalconWatch began in 1997 as an initiative to protect local nesting falcons and promote the recovery of the species. Each summer, volunteers monitor Peregrine chicks and wait for the young to make their first attempt at flight. Once the young birds gain their wings, volunteers ensure the safety of chicks, rescuing them after any crashes, returning the chicks to the nest, or if necessary seeking medical attention for the chicks. A detailed account of the last FalconWatch season can be found on the FalconWatch website. The Birds Committee occasionally offers workshops and talks on bird-related subjects, including bird identification and biology. The most recent Bird Study Group meeting took place in early December covering winter bird field identification skills in preparation for the 2014 Christmas Bird Count. If you would like to be put on the email list for future Bird Study Group meetings, send an email to birdstudy@ofnc.ca. These thirteen migrating birds flew into a glass building in Kanata. Let’s support F.L.A.P. and see if we can prevent bird-building collisions. The Ottawa chapter of the Fatal Light Awareness Program (FLAP) was founded in 2014 by Anouk Hoedeman of the OFNC Birds Committee. 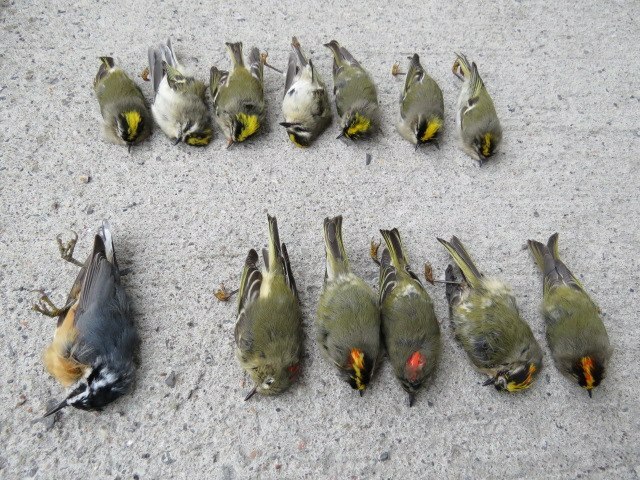 This group aims to document bird-building collisions in Ottawa during spring and fall migration, while concurrently raising awareness of collision prevention and bird-friendly building design. For her work, Anouk was awarded the 2014 OFNC Conservation Award. New volunteers to FLAP are always needed. Please contact FLAP at Ottawa@flap.org if you are interested in getting involved this spring. In October 2014, the Ontario Field Ornithologists held their annual convention in Ottawa. Many Birds Committee members actively participated in this event, leading field excursions and helping to contribute to the 152 species observed over the weekend. Recently, Birds Committee member Bob Cermak was awarded the OFNC President’s Prize for his contribution to the convention for organizing the OFNC-led field trips. The backyard feeder with a Black-capped Chickadee visitor at Fletcher Wildlife Garden. 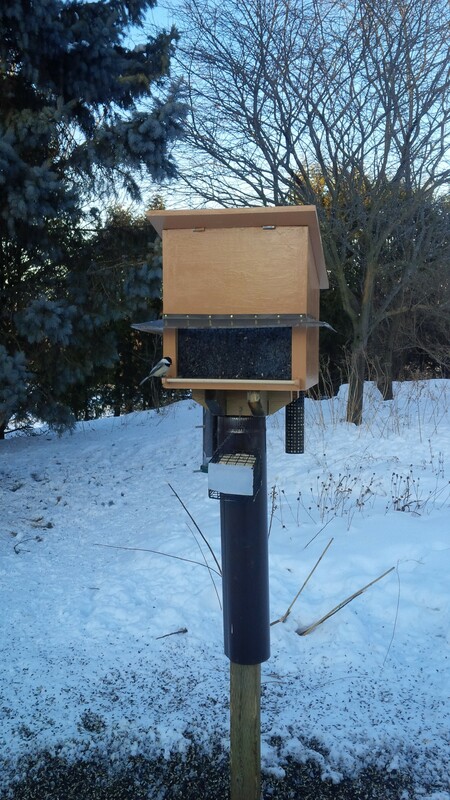 There are six winter bird feeders in the Ottawa/ Gatineau region that are maintained by the Birds Committee. Maps of the feeder locations can be found on the OFNC website. Stop by to enjoy some winter birds! If you would like to learn more about the OFNC Birds Committee and their past and present activities, you are encouraged to visit OFNC birding and bird sightings webpages. Membership information on the committee can be found in the April-June issue of Trail and Landscape. Lastly, if you bump into any birds committee members at a meeting or on an outing, feel free to ask about the committee and its activities! Christmas Bird Count 2014: Downy’s and Hairy’s and Grebes, oh my! Lucy Patterson is a an OFNC member and a PhD student in Biology at the University of Ottawa. Peter Lin very kindly provided the photos. On Sunday, December 14th, 2014, over a hundred birders dug out their binoculars, bird guides and datasheets, and headed out to count every feathered creature they could find in the Ottawa area. It was the day of the 2014 Christmas Bird Count (CBC) in Ottawa, and the weather was near perfect: temperatures hovering around zero, and no wind or precipitation. The CBC is an annual survey run by the Audubon Society. Now in its 115th year, it is the longest-running citizen science program in the world! From December 14th, 2014 to January 5th, 2015, citizens will be counting birds in over 2,300 locations across the Americas. The count provides valuable information about increases or declines in bird populations over time and space. The OFNC has taken part in the CBC since 1920, and has partnered with the Club des ornithologues de l’Outaouais in recent years. It is currently coordinated by the OFNC’s Bernie Ladouceur. Overall, the Ottawa count covers the area within a 12-km radius centred on the Peace Tower. This area is divided into six sectors (Gatineau, Hull, Aylmer, Britannia, Ottawa and Gloucester) and participants are assigned to a smaller area within one of the sectors. At the end of the day, the datasheets from each team are handed in to the sector coordinator, and the data are tallied at a compilation dinner. This year, roughly 27,000 individual birds of 77 different species were observed. Although the numbers are still preliminary, the general findings are as follows. 2014 was a record year for woodpeckers: records were broken for downy, hairy, and pileated woodpeckers; and tied for the red-bellied woodpecker. This may be related to rising levels of the emerald ash borer, a wood-boring beetle living under tree bark, in the region. Record highs were also found for white-breasted nuthatches, white-throated sparrows, dark-eyed juncos, northern cardinals, wild turkeys, and gray catbirds. Also notable was the first-ever record of a black-crowned night heron during a CBC in Ottawa. There were additionally some tied records: northern saw-whet owl, rose-breasted grosbeak, and pied-billed grebe. The highest number for any species recorded in Ottawa in 2014 was for American crows (8,827), although this falls short of the 2008 record of 21,000. Canada geese, gull and finch numbers were lower than average. Finalized totals will be posted on the OFNC website in the New Year. 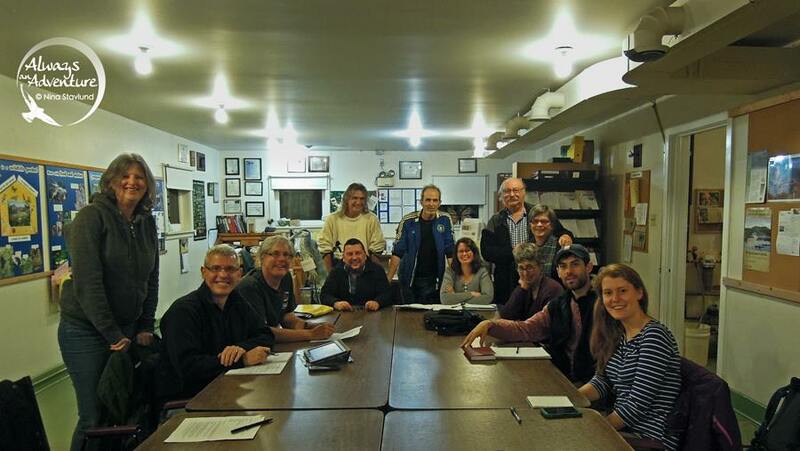 The OFNC Birds Committee organizes a number of birding events. Any club member interested in participating in any of these activities can read more about them at www.ofnc.ca/birding.php.